Captain Picard tells someone what to do. The Emperor is the force of authority, the essence of paternalism. He molds events through the strength of his awesome will. He knows what he needs to do, and he knows what everyone else needs to do too. Jean Luc Picard is a very powerful Emperor archetype. Patrick Stewart is a fine actor who could no doubt play anyone, but we now find ourselves unable to buy his characters when they do not embody the essence of the Emperor. 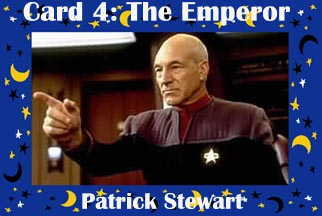 Picard picture spirited away from Patrick Stewart Tribute. Barbara Stanwyck, in "The Big Valley"